In this particular painting, produced in his last years, Morandi achieves the apex of simplification in both colour and composition. The objects are grouped in the centre of the canvas in almost perfect symmetry. The thin impasto, typical of the later production, brings the brushwork to the fore. 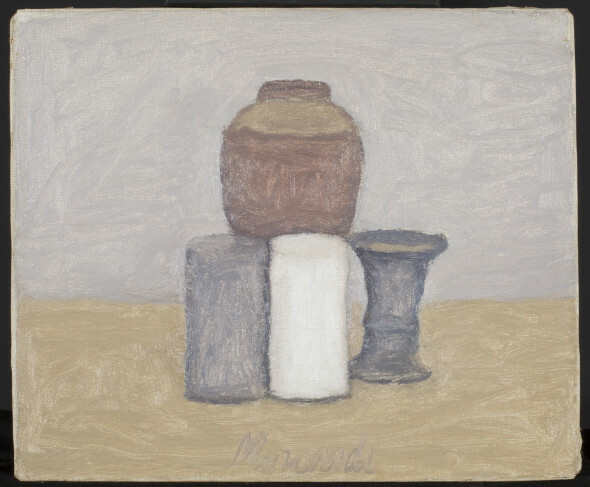 Morandi often emphasises the abstract qualities of his compositions and plays with the viewer’s response. Here, for example, the perceived flatness of the pools of colour contrasts with the implied three-dimensionality of the still life and therefore challenges the viewer’s perception. The artwork described above is subject to changes in availability and price without prior notice. Where applicable ARR will be added.